A microwave drawer offers exceptional convenience without sacrificing coveted counter space. A built-in microwave drawer may be the answer to one of kitchen remodeling’s eternal questions: where to place the microwave, without a) sacrificing valuable counter workspace or, b) creating another major project of reconfiguring the ventilation system above the cooktop. 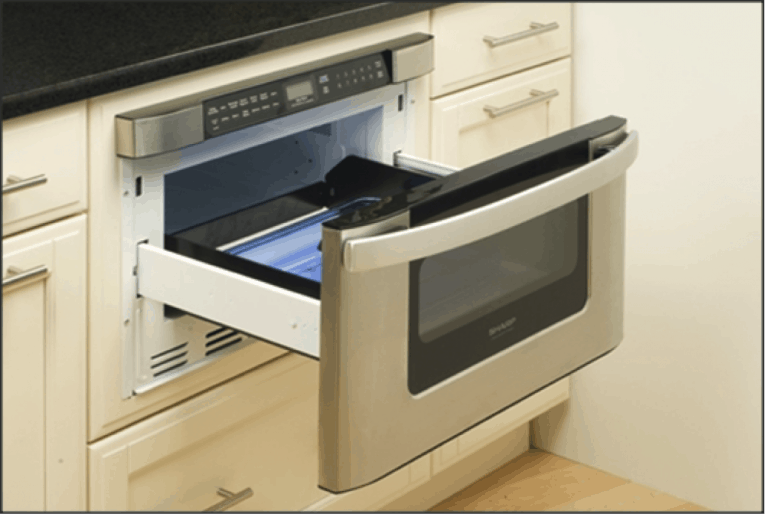 Microwave drawers can be easily installed in base cabinets below countertops or in wall assemblies like wall ovens. Microwave drawers come as preassembled, self-contained units with ventilation systems built in. The cooking compartments may slide in and out with a slight pull or push that activates an electric motor or at the touch of a button. Some units operate with both, and all other electronic controls are usually mounted on the drawer front. The cabinet that you’ll build the microwave drawer into must be equipped with a dedicated, 120-volt, breaker-protected, grounded electric line terminating in a 3-prong receptacle. Most manufacturers recommend that the outlet be positioned in the back of the cabinet at the top. 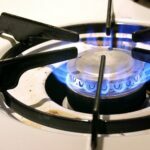 Have a licensed professional do the electrical work. Across all brands, the basic choices are 24-, 27-, and 30-inch microwave drawer units. These dimensions are nominal and refer to the width across the drawer front from left to right. Stock base cabinets are generally available in widths from 12 inches to 60 inches wide in increments of 3 inches, so it shouldn’t be difficult to obtain a cabinet into which the microwave drawer unit will fit, if there’s not one in your kitchen already. The main trick to installing microwave drawers successfully is to select carefully and match the size of the unit to the space available inside the cabinet or wall niche you plan to install it in. That’s not always so easy without actually getting your hands on the unit(s) you’re interested in and taking the overall measurements of the part that fits inside the cabinet. Manufacturers’ spec sheets are famously imprecise and often confusing. For aesthetic purposes, it’s also important to measure the overall width and height of the microwave drawer front to make sure that it’ll overlap the rails and stiles of cabinet that it will be installed in and align pleasingly with adjacent cabinet fronts, namely doors and drawer fronts. As you select and plan, also mind the door height, the height of the microwave enclosure that’s to fit inside the cabinet and recommended clearances specified by the manufacturer. In all likelihood, the position of the shelf on which the floor of the microwave will rest will have to be adjusted for successful installation. If the cabinet has a face-frame, measure the width of the opening across the front from left to right between the stiles (vertical frame members). Will the microwave drawer unit fit in, or will you have to trim the inside edges of the face frame? If you do need to trim, you can use a router with a trim bit and guide or a reciprocating saw to enlarge the opening. 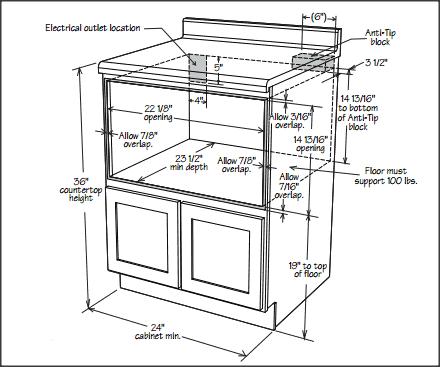 If the cabinet doesn’t have a face frame, you may have to add some 1-by-2s or some other form of filler panels to the inside of the cabinet sides to narrow the opening and provide an adequate fastening surface for the microwave drawer flange, which will ultimately be screwed to the cabinet face to hold the unit in place. Also compare the inside depth of the cabinet to the depth of the microwave drawer enclosure measured from the face flange to the back of the unit. Will the flange fit flush against the front edges of the cabinet or face frame? If not, try cutting out the back of the cabinet to gain more space. You need to establish a shelf or platform for the microwave drawer to rest on. With a helper, set the complete microwave unit on blocks inside the cabinet, using shims to get it to exactly the right height, parallel to the bottom of the countertop and/or top rail. When the temporary position of the unit seems perfect, mark the inside of the cabinet walls, tracing with a marker against the bottom of the microwave enclosure. Cut a shelf from ¾-inch plywood. Fasten wooden cleats to the inside of the cabinet ¾ inches below those marks and then fasten the plywood shelf on top of them. The shelf must be stationary and sturdy enough to support a minimum of 150 pounds. 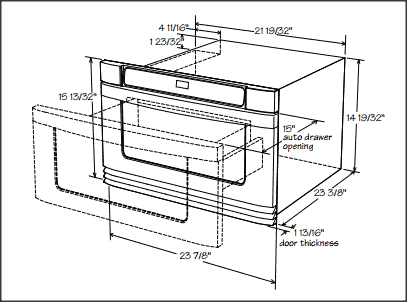 Cutout opening requirements for a Sharp 24-inch microwave drawer; requirements differ for different sizes and brands. Depending on the design of your kitchen cabinets, you may wish to add a face-frame rail (horizontal member) to conceal the edge of the shelf. Your cabinet manufacturer can probably supply a length of matching stock. You may also order new doors or drawer fronts of the correct size to finish the opening below the microwave installation. Also note in the drawing above that you’ll need to install an “anti-tip block” wedge to the installed microwave drawer against the top of the cabinet. Use a block of 2-by lumber trimmed to whatever dimension provides a tight fit. The anti-tip block should be screwed to the cabinet sidewall. With the cutout finished and the outlet and anti-tip block in place, plug the microwave’s power cord in, and slide the unit into the opening. Drive screws through the face flange when it’s flush with the cabinet front, and you’re done. 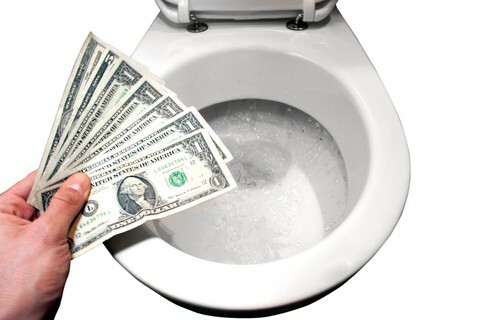 Michael Chotiner is an expert home-construction DIYer and writes on home appliances for Home Depot. Michael’s advice on microwave drawers is geared to help homeowners understand the basics of installation. Home Depot’s selection of microwave drawers, as well as a full assortment of microwave ovens, can be viewed on the Home Depot website.